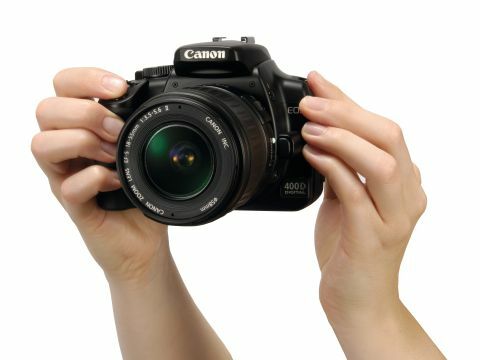 The 400D, according to all the hype, is set to become the world's most popular digital SLR. In terms of looks, build and sheer usability, this tiny powerhouse of a camera borrows heavily from its acclaimed forerunner, the hugely successful and very likeable eightmegapixel 350D. To bring it into line with some of the competition, it adds another two million pixels to the APS-C size sensor and gains a much larger TFT, which is a lot easier to see at a glance or even in bright sunlight. Maybe it's just as well, because the same screen is used to display the camera's settings all the time now and it's a big improvement over the squat data panel on the back of the old model. Battery life is lessened to a degree, but you'll still see 250 or more shots per charge. Also new is the wide-area ninepoint AF system from the semi-pro 30D, and it's super-fast and accurate even when the light begins to drop - at dusk, for example, or inside under tungsten lighting. Best of all, though, is the addition of new dust-busting features. Even if you don't plan to use anything other than the 18-55mm (28-90mm equivalent) kit lens, dust will eventually find its way on to the sensor. Anyone who has used a digital SLR will know just how desperate they felt when they first saw the annoying black specks on their snaps. Like some rivals, the 400D uses clever technology to shake those tiny particles from the filter's surface. Although very effective by itself, provided you've taken a snap of a clean, white surface to map the location of the dust beforehand, any persistent dust particles can be removed automatically in the bundled RAW conversion software. Manual controls are there if you need them, but you know from the instant you pick it up the 400D will be fun to use. Picture quality is simply superb. Outdoors, images show fine gradation and precise colour from any of the shooting modes. And, due to the physically larger sensor than those used in digital compacts, noise isn't as much of an issue, even at the maximum setting of ISO1600.